At ASAP, your safety and security is our top priority. We are proud of the fast, reliable service we offer, and are committed to providing peace of mind to our customers. Whether you are a stranded driver, a business with a private parking lot, or need a place to store your vehicle; our professional and friendly staff is available to you 24-7. Our dispatchers will send out the appropriate vehicle for your job from the closest location to assist you at any time of day. 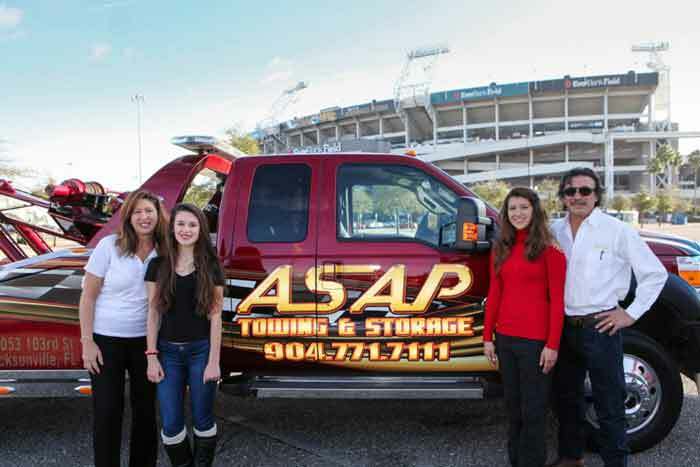 ASAP Towing & Storage is a family owned and operated business. Vince and Vanice Serrano started the company in 1995 with one vehicle and three employees. They have since grown ASAP to more than 30 trucks, six locations, and multiple divisions across Jacksonville and St. Augustine. ASAP Towing & Storage holds an A+ rating with the Better Business Bureau. Co-owner, Vanice Serrano, was also named the Small Business Leader of the Year in 2013 by the Jacksonville Chamber of Commerce for her dedication to business growth and the towing industry. ASAP Towing & Storage’s tow away signs are located at EverBank Field, all major malls, and can be seen at more than 450 apartment, condominium and HOA communities around the First Coast. We are a premier sponsor for a number of organizations including the First Coast Apartment Association; IREM (Institute of Real Estate Management); NFHLA (North Florida Hotel and Lodging Association); First Coast Hispanic Chamber of Commerce; and the Jacksonville, Clay County and St. Johns County Chambers of Commerce.